Three Things Consulting’s Indigenous Awareness Community Talking Circles allow for trusting, respectful and reciprocal relationships to be built and enhanced through a daylong Circle that builds awareness and knowledge sharing, increased confidence in talking further about strengths, history and challenges of Indigenous people in Canada, along with much improved communications between all participants. We have demonstrated that our Circles, led by Indigenous thought leaders, young people and Elders provide a meaningful opportunity for members of a community to gain and share knowledge, understanding, capacity and ideas as it applies to the bringing together of indigenous and non-indigenous peoples together. 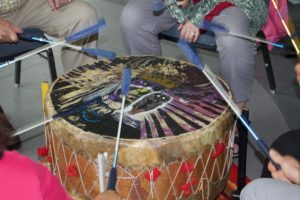 Rooted in the United Nations Declaration on the Rights of Indigenous Peoples and guided by recommendations from the Truth and Reconciliation Findings and Call to Action, these Circles have been developed by Indigenous Peoples with consultation with our local community and training, education and engagement experts: allowing for an experience that is comprehensive, respectful and honourable. With a growing interest from Canadians to learn a more accurate history of Canada and build new relationships with their Indigenous neighbors, members of your community or organization are ready to participate – and talk, share and learn. Our approach applies lessons from the Seven Sacred Teachings and these are strengthened when we are working, sharing and learning in Circle. We practice the laws described in the teachings: Resp ect, Honesty, Wisdom, Love, Bravery, Truth and Humility in our facilitation approach and encourage participants to do the same. By being in Circle it allows us to see each other, have contact with each other directly and reminds us, that regardless of your role, lived experience or capacity – we are all equal in Circle; we will all have the space needed to define as our own. The Circle promotes understanding, builds trust, helps us solve problems, reminds us that we are not alone, share in our common experiences and respect not just each other, but ourselves. We may discuss challenging topics and share traumatic episodes that generate painful moments inside a Circle, which is natural. It is how we respond to this, by being together in the Circle that is important. Those moments are lessened as they are not attached at that moment to feelings of isolation and shame; those attachments are removed. They simply are. The become lessons in the journey. An increased understanding and cultural awareness of Indigenous peoples, which is when we acknowledge the differences that exists between cultures. An increased understanding of cultural sensitivity where we acknowledge the significance of respecting the differences that exists, especially in Canadian history and how the story of Canada has been shared to date. An increased overall cultural competence about Indigenous issues in your community and across Canada – so building what residents know, how residents feel and how well residents put this knowledge into practice in their lives. In learning, sharing and building relationships rooted in reconciliation, all participants will be better equipped to understand and celebrate a true Canadian identity with a new understanding of how diverse that can be and not subduing other identities as Indigenous Peoples. By sharing powerful and relevant experiences we believe each group of participants will have new relationships that will live on much longer than the Circles themselves. Organizations, individuals, appointees, businesses, leaders, youth, children, Elders/Seniors, educators and government. Those who want to create a change in response to the TRC Report – in their own lives and their community. Those who want to learn how to outreach, recruit and retain qualified Indigenous employees/volunteers in respectful and honourable ways. Those who want to learn how to build positive trusting relationships to enhance the consultation and engagement process with Indigenous peoples. Those who have an interest in learning more about Indigenous communities and where they are today. Though we offer a series of Circles, each digging deeper and building capacity, it is the first of the four available Circles that allows the beginning of journey for individuals. Participating in these Circles supports professionals, community members and specific populations, (youth, newcomers, seniors) the opportunity to build their awareness, understanding and competency as they walk towards the path of reconciliation. Our proposed Indigenous Awareness Community Talking Circle for your community or organization provides meaningful outcomes that will lead to an increased understanding and cultural awareness of Indigenous Peoples, acknowledging the differences that exists between cultures. This session would be designed to provide all participants a basic understanding of Indigenous cultures and beliefs, basic history of the Indigenous peoples’ movements prior to European settlement and encouraging the development of mutual awareness, understanding and appreciation among all participants. Our Circles are led by a strong team of diverse facilitators, each with their own skill set supported by Elders and / or Knowledge Keepers. This daylong session, (6 – 8 hours) will empower further exploration either individually or as a group and help ensure your organization or community is best prepared to develop respectful, honourable relationships and partnerships with the Indigenous community. Taking part in a Circle doesn’t by any means indicate someone has reconciled – it is the starting place of a journey, that has no end: reconciliation is and will always be an ongoing process that is demonstrated, in action. Contact us for more information and to plan your Community Talking Circle.